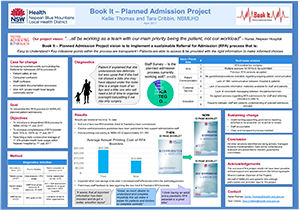 This project aims to introduce a transparent Referral for Admission (RFA) process within Nepean Blue Mountains Local Health District (NBMLHD). A review of existing processes, policies, documentation and support provided to staff and consumers was undertaken. Four areas were identified that had key issues identified to be addressed. Referral for Admission booklet and processes – too complex, lack of governance surrounding submission process. Patient Communication – variable among staff. Customer Service – lack of accessible resources and information for staff and patients. Education – disparity between staff and patients understanding of planned admission process. To introduce a transparent RFA process for elective surgery patients in NBMLHD by 1 July 2017. Allows hospitals to identify eligible private health patients more easily. Provides cost efficiencies for healthcare services. Provides a streamlined and sustainable RFA process. Meets the health information requirements for elective surgery patients. Improves patient and staff understanding of the elective surgery process. Provides patients with the information they need to make informed choices. During 2015 it was being identified at a local level within Nepean Hospital via various reporting and committee structures that a review of the admission and booking process of planned elective surgery patients’ needs to be undertaken due to increased patient complaints, staff and patient confusion surrounding RFA processes, adverse events and inefficiencies identified within the current system. As part of service agreement between NBMLHD and Ministry of Health (MoH), a private health fund revenue target is allocated to the LHD based on demographics within the area. The current private health fund revenue target for NBMLHD is 17.2%. In March 2016, planned elective surgery admissions at Nepean Hospital monthly average of private health fund usage was only 11.82%. Planned solutions to be implemented during 2017 include the following. New adult and paediatric RFA booklets (April 2017). Previous RFA booklet was 32 pages in length which was overwhelming and confusing for staff and consumers to complete. New booklets are 16 pages (adult) and 12 pages (paediatric) in length and predominantly ‘tick box’ fields to help ensure the correct information is being collected and highlighted at time of wait-listing. A ‘Special Alerts’ feature has been introduced to the RFA to help identify and flag those patients at risk. New ‘Administrative Management of Elective Surgical waiting lists’ procedure to support NSW Health policy directive Waiting Time and Elective Surgery Policy1 at a local level within the LHD (April 2017). NBMLHD Elective Surgery Wait List checklist tool (April 2017). The checklist tool will be used to help booking staff review submitted RFAs and as a training tool for new staff. audit of 32 new adult RFA booklets submitted at Nepean Hospital in April 2017, showed 66% were completed on submission. This is a dramatic increase compared to previous version audit of 34 RFA booklets submitted at Nepean Hospital in May 2016, only 35% was completed on submission. Continue to believe in the redesign methodology throughout the project. Communication and transparency with stakeholders is very important. Always continue to check in with your stakeholders to help keep their engagement with the project. NSW Ministry of Health. Policy Directive: Waiting Time and Elective Surgery Policy. Document number PD2012_011. North Sydney: NSW Health; 2012.